ALBANY — The Wallace Foundation has selected Albany State University to participate in a national $47 million initiative to develop models over the next four years for improving university principal preparation programs. The initiative will examine state policy for efforts to strengthen quality training statewide. “This award is a significant development for Albany State University and the school systems in Southwest Georgia,” said Thomas Thompson, dean of the ASU College of Education. “With the high level of poverty and diminishing opportunities for gainful employment in this region, particularly among our population of teenagers and young adults, access to high quality public education via highly effective elementary and secondary schools is crucial; and it all starts with the quality of leadership provided by the principals in our children’s schools. Albany State will redesign its Educational Leadership program, offered by the ASU College of Education. ASU is one of seven universities selected by the Wallace Foundation and one of two historically black colleges or universities (HBCU) in the nation to receive funding this year for the initiative. 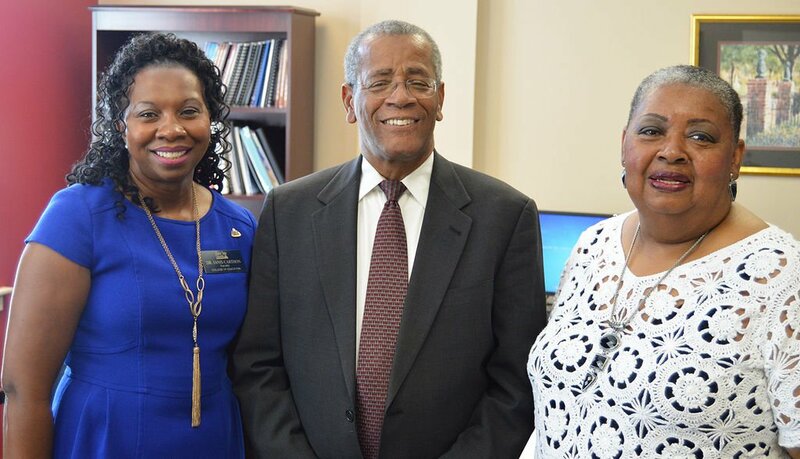 “The redesign of Albany State University’s Educational Leadership program is a wonderful opportunity for the institution to improve the effectiveness of educators in the region and the state,” ASU President Art Dunning said. “Our faculty and staff members are dedicated to ensuring that exceptional training is provided to all Educational Leadership program participants. ASU will receive assistance for the redesign from the Gwinnett County Public Schools Quality-Plus Leader Academy and the New York Leadership Academy, two organizations that have gone through the process with the Wallace Foundation. Albany State will partner with the Dougherty County, Pelham city and Calhoun County school systems, and with the Georgia Professional Standards Commission to ensure that the training is revamped with local school needs in mind. ASU and its district and state partners will receive $7.75 million over a four-year period to complete necessary requirements. “We have proposed a program that is performance-based where we take the training out of the ivory towers and into the school systems where our students will be paired with mentors and coaches that will allow them to apply the principles of excellent school leadership,” Deborah Bembry, ASU professor and chair of the Department of Counseling and Educational Leadership, said. She is the principal investigator for the project. “With the university, districts and state working together, we will produce a model of principal preparation that can be used across the state and even the nation,” she said. The Wallace Foundation was interested in finding university programs that serve districts with large numbers of disadvantaged students, schools that could particularly benefit from effective school leadership. The selection process included site visits and assistance from experts in state policy and education. “We know from research that school principals require excellent training with high-quality, practical experiences to become effective leaders, but most are simply not getting this,” Will Miller, president of the Wallace Foundation, said. “Because many school districts don’t have the capacity to train as many principals as they need or to train future principals at all, the best way to reach more aspiring school leaders is through the university programs that typically provide needed certification. — Developing state policies about program accreditation, principal licensure or certification, and other matters, such as funded internships, to promote more effective training statewide. A luncheon to celebrate the redesign of the program and to recognize Albany State’s College of Education faculty members, local and state initiative partners, and Wallace Foundation representatives will be conducted Oct. 24 in the Student Center ballroom.